I hope everyone had a Merry Christmas! That's a fine looking knife DP. Does it actually have a bunch of dimples in it or is that an illusion? Knife is way cool. Can it open a can of paint though? Maybe, but probably only once. It'll cut the hell out of onions though. I finally got to use it last night when I used the pressure cooker to make some French onion soup. The chopping motion...as opposed to the more standard slicing...took a little getting used to, but once I did I sailed through a half-dozen onions in no time at all. I even ended up with the same number of fingers I started out with. Here's something else that Santa brought me. 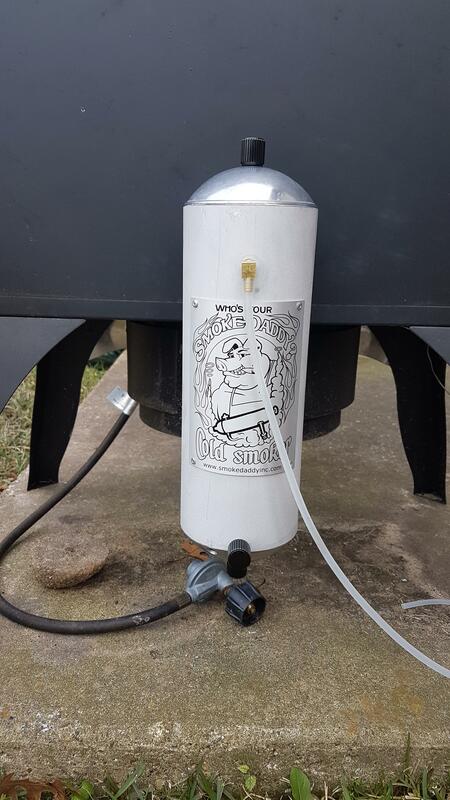 The Smoke Daddy "Magnum" cold smoke generator. It took me about 10 minutes to install it onto the back of my smoker (not counting the trip to Home Depot for a 1 1/8" hole saw). My plan is to try it out on some blocks of cheese this weekend. 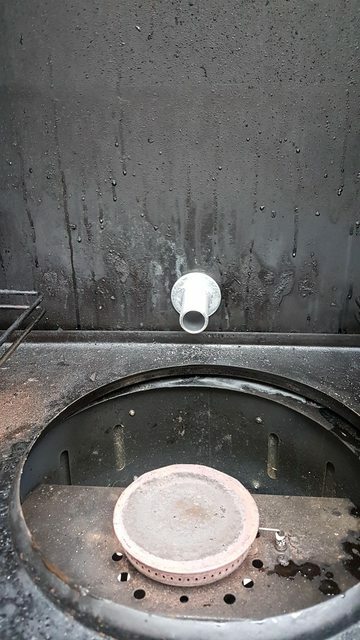 Yeah, the smoker could use a cleaning. Cool. I'll give you a little advice on the cheese smoking. You are not going to want to smoke the whole block of cheese as the smoke won't penetrate all the way through. I cut mine into maybe 3x5" blocks. Also, I've found the two hours is plenty on cheese or it can be too much. Post your pics when you do it. The advice though was for wood smoking and may not be appropriate for that doodad you've got. The 2 hour limit is good info. I was reading some sources that said 3-4 hours, but that does sound like a bit much. I'll go for 2 instead. And the Smoke Daddy does use wood chunks (or chips, or even pellets), so your advice would be applicable. Thanks. Also, I currently have some hickory, pecan and apple wood chunks. I'm thinking the milder apple would be the way to go with cheese. Thoughts? I've done it with oak and I've done it with pecan. I don't know whether I can tell a difference. I think the apple sounds great. Your cheese sizes are perfect. I've done the 3-4 hours smoking time when I first started doing it. Way too much. 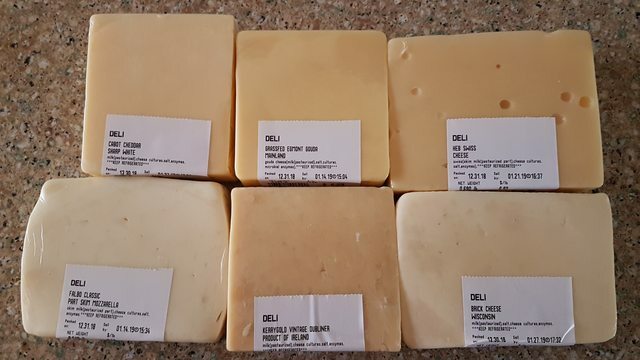 I've smoked Havarti and some other mild cheeses but my favorite is just good old cheddar. I'd be interested if you come to the same conclusion. Nothing better than making a grilled cheese samich with your smoked cheese or having it with crackers and chili (with beans of course). One more thing I forgot to mention. I do turn the cheese (flip over) about the midway point. Good info. For how many days to you let the cheese sit wrapped in the fridge in order to "mellow" the smoke flavor? I guess I don't know how to answer that. I've chilled them back up and then into the tummy. I did make some extra which I froze. I pulled one out yesterday and had it with chili. Delightful.